Many long years ago, everyone in our office had a PaperPort hooked up to their Mac desktops. If anyone gave you a piece of paper, you just pushed the paper into the entry area and the scanner gobbled it up, resulting in a image on the screen that we could file away in a folder, email, insert into a document… even sometimes we would print it later. The important part was no one every lost the paper on someone else’s desk. There are options on the market now that have replaced the old wire and specialized plug with USB and even wireless. 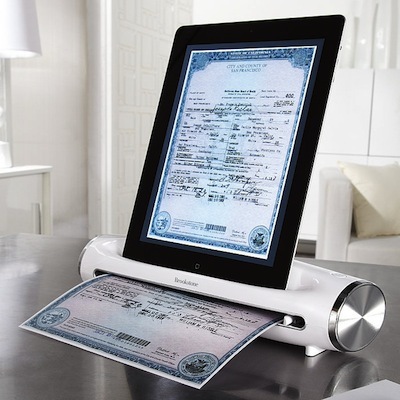 Now, Brookstone introduces one of these smaller scanners (12.1″w x 4.4″d x 2.8″h and weighing just 1.44 lbs), with a iPad doc on it. No need to take the paperwork to the computer, now you can scan where the papers are. Put a scanner on the kitchen counter, open print mail or get your hands on a new recipe, turn that paper into a digital image on your iPad. We have yet to see one of these in action, but expect someone on the team to be buzzing by the mall and report back if they where able to touch one. To use, there is a free related app that ‘sees’ the scanner, collects the scanner’s data and converts it to a 300 dpi jpeg file. 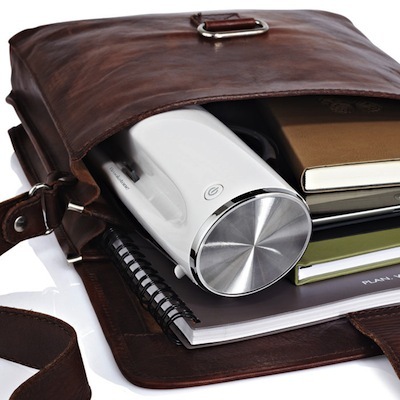 We would assume these could be shared to your cloud or network storage pretty easily. Interesting, Brookstone took the time to mention that taking photos of your documents is not as good. We have good luck with Genius Scan+ software but agree that getting lighting correct in the kitchen and other household rooms that have multiple small lights that create shadows.